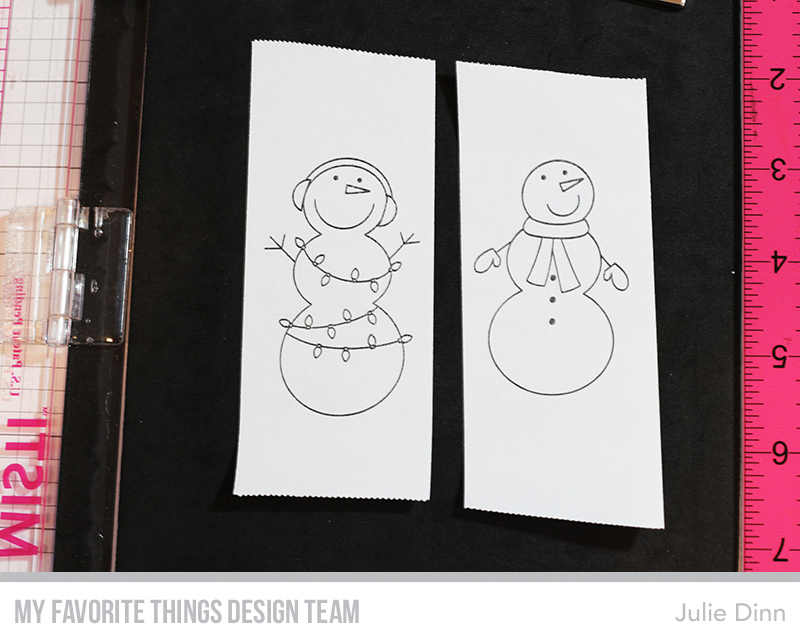 I started out by stamping my two snowmen on my card stock and then on Post-It tape. I like to use Post-It tape for masking because it sticks so well. I cut out the snowmen and carefully placed them on the card stock over top of the images. You want to be as exact as possible doing this so there are no white spaces left when you pull up the mask. At this point, things are still going well! I sponged on Spun Sugar, Worn Lipstick, and Picked Raspberry Oxide ink. The Oxide Inks blend so effortlessly, I LOVE them! 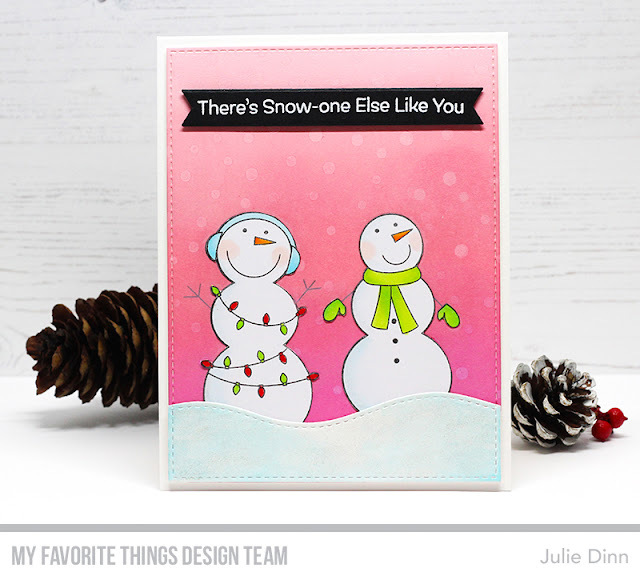 I then added some snow with the Snowfall Stencil and Sweet Tooth Pigment Ink. I peeled off the mask and filled in any little white spots that were left on the sides of the images with a paintbrush and Oxide Ink. The Oxide ink is so wet it works wonderfully for this trick. This is where disaster struck. LOL I grabbed a couple of Copics and started to colour the lights. I hadn't paid attention to the card stock I started with, needless to say, the card stock was not Copic friendly! My red ink started to bleed almost immediately. I tried in vain to clean it up with Blender Solution, but there was nothing I could do. 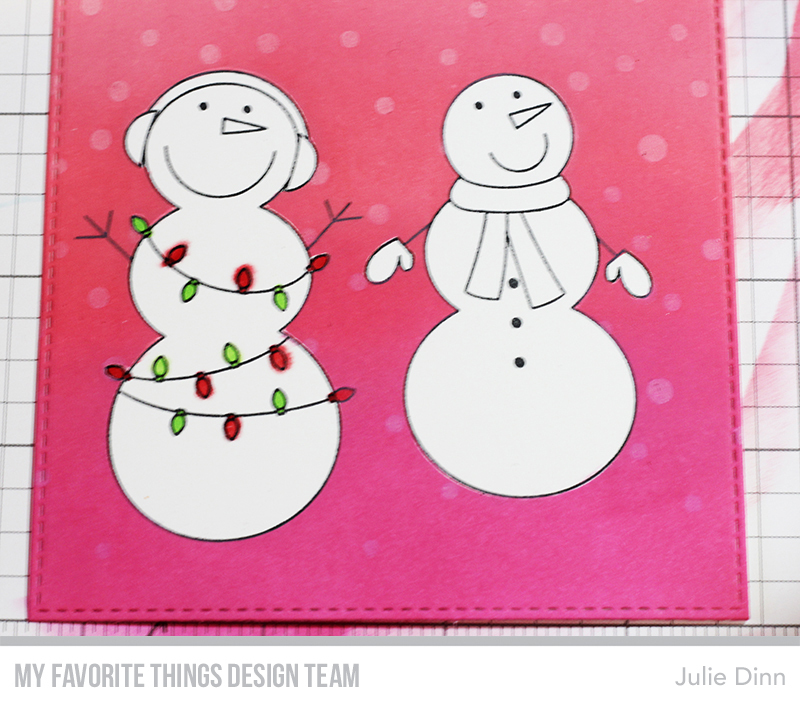 I really liked how the background had turned out and I didn't want to start over again, so I stamped the snowmen on X-press It card stock, coloured them with Copics and then fussy cut them out. If you should find yourself in a similar situation and you need to fussy cut your image, I recommend taking a non-Copic black marker or pencil and running it along the edges of your image. That will hide any white card stock that may be showing. 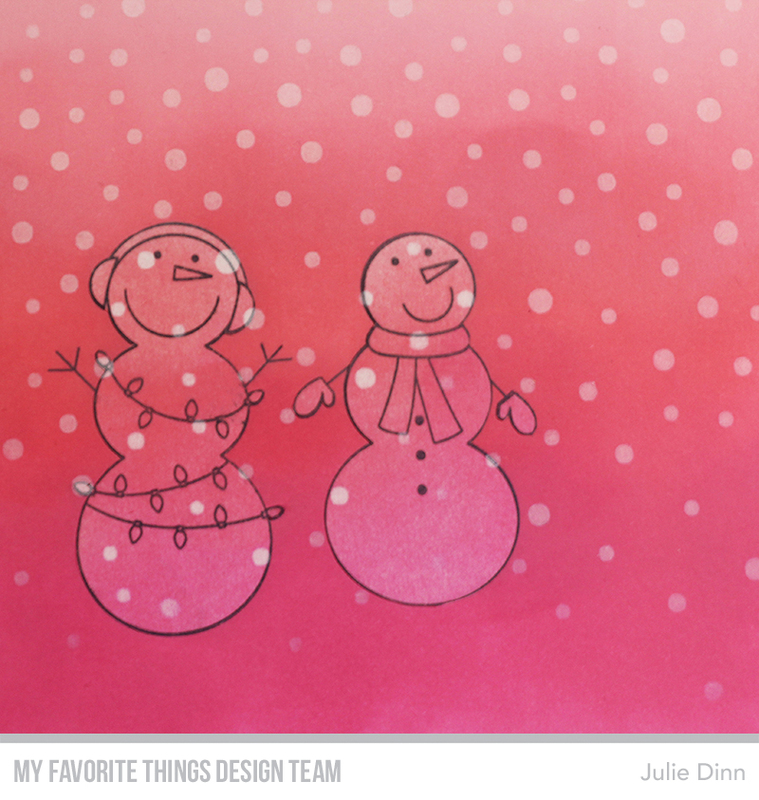 Once I had the snowmen coloured and safely adhered to the card stock, I added a little bit of shimmer to the left side of their bodies. That little bit of sparkle will catch your eye, but it is not too overwhelming. Thank you so much for joining me again today. I hope you learned a tip or two. 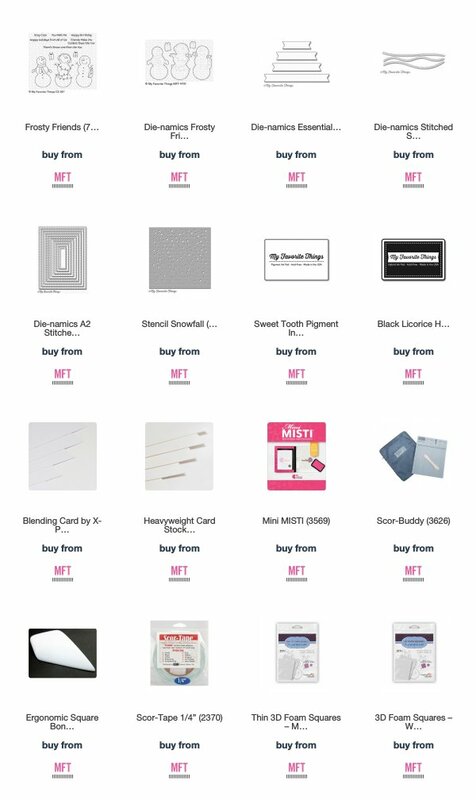 Be sure to check out the MFT Blog to see all the amazing creations the design team has to share with you today. So cute! 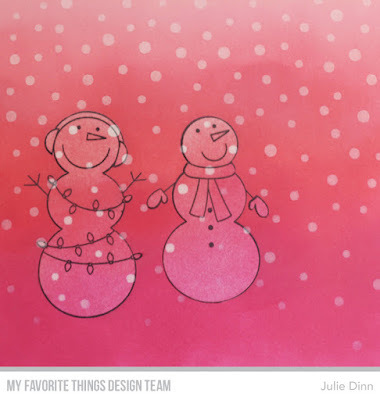 I love the snowmen! !